Read about Abby's experiences with the Luther dance program and her first year after graduation. Read about James' experiences with dance Professor Jane Hawley and how her influence has lead him to his successful career in dance. Read about Catherine's experience connecting her dance and psychology majors in her career as an occupational therapist. Meet Kyla Grau '17 and learn how her research and courses at Luther helped her become an effective French teacher. Learn how Marlene Jones '17 uses her French major to teach English grammar and conversational lab at Université de Bretagne Occidentale in Brest, France. Learn about Sidney Larsen '17 and why her travel to and ability to communicate in French-speaking countries has been a highlight for her. Discover why McKenna believes that Luther prepared her well for life as a medical student and a future physician. Learn how Ryan Goos '16 uses his background in Spanish, international studies, and linguistics in his career. Meet Miriam Harries '16 and learn how Luther allowed her to combine her love of theatre, statistics, and computer science. Read about William's experiences abroad, and on campus learning about politics and international relations. Read about Emily Holm '16 and learn how her major, work-study experiences, and time abroad helped prepare her for her career. Read about Alanna Spencer '16, her experiences at Luther, and how they influenced the first step in her career. 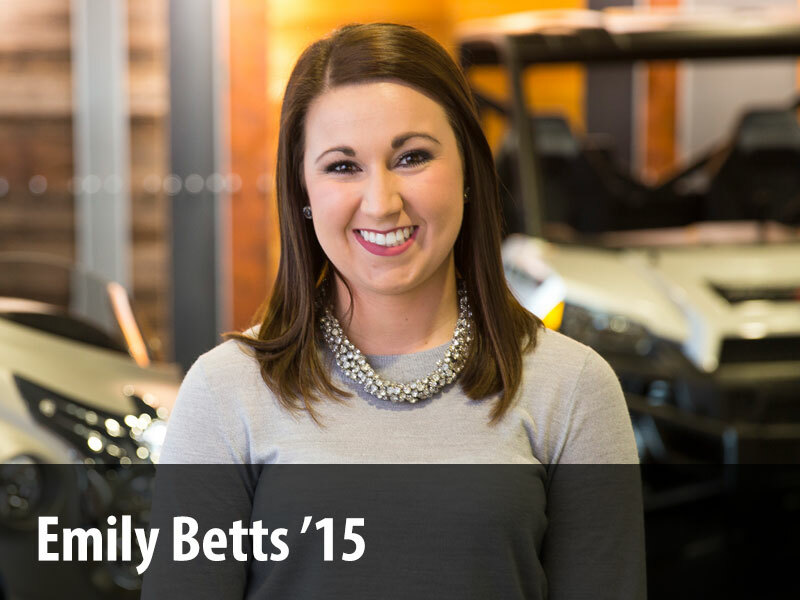 Learn about Emily Betts '15 and how her multiple experiences at Luther led to her current position as a project manager. Discover why Anna Dieter '15 chose Luther as the best place to pursue her desire to teach middle school math. Learn about Carly's love of art and communication studies, and how Luther allowed her to pursue her passions. Read about Hanna Knutson '15 and discover how Luther faculty facilitated ways to expose her to areas of design she wanted to know more about. Meet Sam Olson '15 and learn how his first career moves have aligned with his passions for French and business. Read about Cole Puffer and learn how, along with his scientific education, he appreciated learning about philosophy, religion, and the arts. Learn more about Emily Sena '15 and Luther opened her eyes to the possibilities around her. Meet Krista Wahlstrom '15 and learn why she thinks her biology degree provided a perfect path to pursue neuroscience. Learn about Cate Anderson '14 and how her studies in French and History sparked an interest in peacemaking and led her to work with refugee populations. Meet Madeline Davidson '14 and learn how Luther fostered her interest in acoustics and music and helped prepare her for graduate school. Get to know Catherine (Gehlsen) Hillestad '14 and how her studies in biology and French led her to pursue graduate studies in healthcare administration. Learn how Victoria Ewald '14 discovered her interest in neuroscience and why she believes Luther chose her. Learn how Delaney McMullan '14 has realized that the skills she acquired from her liberal arts education have proven to be very useful at law school. Meet Jamie Stallman '14 and learn how his undergraduate interests in religion and the environment have led him to Union Theological Seminary. See how the opportunities at Luther helped Matt Yan '14 develop the skills necessary to pursue his love for literature and writing. Read about the important skills Nick Andresen '13 acquired during his time at Luther and his path to medical school after graduation. Learn about Laura Harney '13, the extracurricular activities she participated in, her relationships with faculty, and her opportunity to study abroad. Meet Hannah Myott '13, whose German and anthropology majors led her to travel the world as a freelance writer and German translator. Meet Denise Richter '13 and learn how the liberal arts helped her discover her interest in accounting and land a job at John Deere. Read about Kimmy Rooney '13 and learn how her courses and experiences at Luther inspired her to become a professor at the collegiate level. Meet Lindsay Sheriday '13 and learn how how mentors in Luther's music department still influence her today. Meet Sam Simataa '13 and learn how he uses his education in his current role as an IT Business Analyst and how he's still involved at Luther today. View the Luther profile for Emily Voss '13, photographer/owner, VOSStudios, Wausau, Wisconsin. Emily's majors were Art and Spanish. Meet Bailey Cahlander '12 and learn how her art major and work-study gave her the experience and training she needed to excel in her career today. Check out the Luther profile for Katie Carnes '12. Katie was a communications studies major and works as a trainer at Epic Systems, Verona, Wisconsin. See the Luther profile for Anna (Looft) Fett '12. Anna earned a master’s degree in theological studies from Harvard Divinity School, Harvard University. Learn more about Ashley (Matthys) Gibson '12 and how her experiences at Luther made her more well-rounded and contributed to her success today. Meet Peter Graffy '12 and learn how his coursework at Luther made his post-graduation plans possible. Meet Jasper Kange and learn about the impact his art major has made on his career. Learn how an internship helped Erin Spanczak '12 find her first professional job opportunity in the accounting field. See the Luther profile for Benell Weatherspoon '12. She is a registered nurse on the Behavioral Health Unit at Novant Health Presbyterian Medical Center. Read about Jake Wittman '12 and how experiences after graduation and Luther connections affected his career choices. Find out why Dallas Wulf '12 appreciates his liberal arts education and how it helped prepare him for graduate school and his doctorate program. Learn more about Rachel Barclay '11 and how being on Luther's campus made her excited to learn and take advantage of the study abroad opportunities. Meet Kim Horner '11 and learn why the opportunities she had to engage with students and communities outside of the classroom were valuable to her at Luther. Meet Elise Sinnwell and learn how her coursework in biology helped her prepare for a physician assistant graduate program. Read about Jake '10 and Kelsey (Vaaler) Vaith '11 and learn what they've been doing since graduating from Luther. Read how Kelsey Wauters' career path in the accounting field has taken shape since graduation. Check out the Luther profiles for Jake and Whitney (Keltner) Wessels '11. Jake had majors in chemistry and biology and Whitney was a psychology major. Learn more about Mike Byrd '10, a student at New York University School of Law, his experiences since graduation, and his advice for first-year students and new grads. Learn about Josh Gerber '10. See how Luther connections helped him make his first business decisions and grow his company. Read about Sarah Lilly '10. She is currently a kindergarten teacher at Agamim Classical Academy. Discover how co-curriculars, work study, and an internship provided lasting benefits for the museum career for Katie Prichard '10. Learn about the steps Tiffany Choi '09 has taken since graduation to build her career as a high school French teacher in Denver, Colorado. Learn about Bailey Miller '09 and what she loved about her study abroad trips and how her experiences helped her prepare a strong resume for her career. Learn how Luther connections helped Sarah land an internship, her first professional job, and current position as Chief Operating Officer at 9 Clouds. Discover how Matt Cox '08 uses his major and minor every day in his work at the Minnesota Children's Museum. See how an internship helped Melissa Hunter '08 make an early career decision and how the Luther swim team has provided her with lifelong friendships. Meet John Meyer '08 and learn how his experiences at Luther helped shape his career choices and how he became a successful entrepreneur. Learn about Thomas Sines '08 and how his study abroad experience in Argentina helped prepare him for his career. Learn how diverse experiences at Luther helped Nathaniel Anderson '07 become a more well-rounded pastor and global citizen. Learn about Karin Maxey '07, and how Luther's supportive community prepared her for a career in academia. Find out how Kendra created her own major to explore her unique interests through the Individualized Interdisciplinary Major. Learn how Luther College's Theatre and Dance programs "perfectly" prepared Katie to pursue an MFA a Naropa University in Boulder, Colorado. Discover how Jasmine (High) Heckman's '06 experiences and education spurred her interest in museum studies and helped her land her first jobs. Meet Rachel (Bails) Jeffrey '06, a middle school teacher in Colorado Springs, Colorado. She majored in history and had a minor in secondary education. Learn about Megan Clark's '05 experiences with study abroad and work study and how they helped her discover her passion for anthropology. Read about Maggie Gill '05 and learn why she's amazed by neuroscience. Meet Erik Fern' '04 and learn how his political science courses generated his interest in law. Learn how Luther helped Jen Gipp '04 prepare for her career, expand her interests in the larger world, and establish lifelong friendships. Learn more about Anthony Nunez '04, whose liberal arts education led him to make a difference in children's lives at Jacob E. Manch Elementary School. Learn about Jennifer Tomscha '04, how she arrived at her current occupation, and her definition of a "global citizen." Read about Micheal Toso '04 and learn how international experiences shaped his career. Learn how Luther allowed Em to pursue her two passions: theatre and psychology, and how that influenced her career. Meet Anne-Marie Hanson and learn how her anthropology courses and experiences studying abroad inspired her career. Meet Janelle Olson '03 and learn how her chemistry and biology majors helped her find a role she loves at Be the Match. Read about Molly Goodwin '02 and how her experiences at Luther prepared her for a career as a professional stage manager. Discover why Ross Larson '02 thinks learning another language helps him better understand himself and the events in the country where he lives. Learn about the nonprofit organization Eli co-founded and how his career took shape. Meet Katie Sopoci Drake '01, and learn about how Luther College music and dance have influenced her career as a performer and choreographer. Meet Heather Morris '01 and learn how her work-study experience and major provided the knowledge and skills she needed in her career. See how Sarah O'Banion's experience in choir led her to change her major, and how this decision affected her career path and opportunities after graduation. Meet Heather Schacht Reisinger ’96 and learn why a major in anthropology proved to be a good fit for her. Learn how Karla (Sylling) Bloem's '94 interests and unique experiences at Luther helped her build the International Owl Center. Read about Carol (Edwards) Denekas '91, and learn how her interactions with professors and experiences on campus prepared her for life after Luther. Learn how Luther nurtured Patrick Strain '91 as a theatre artist and a Christian. Discover how an elective course influenced a career decision for Jodi Evans '84. Read about Arne Sorenson '80 and how his firsthand exposure to other cultures helped him gain a deeper knowledge of global issues.